Jane co-led a performance project Testing Ground towards performance on Saturday 18th November 2017 at Conway Hall with The Conway Collective. We started considering european flags – do they bind or blind us? or are they for the bin? towards a sharing of experimental performance ideas developed over four weeks of workshops and responding to the history of ideas resonating throughout the fabric of Conway Hall, a home of modern innovative thinking and culture creation. Directed by Luke Dixon and Jane Turner exploring techniques and ideas that draw on games, flocking, science, gender representations, tango, art, and storytelling. Performers: Theresa Hoffman, Maja Laskowska, Paola Napolitano, Tanya Latwal, Jessica Sabatini, Angie Goddard, Sally Souraya. A work in progress that has emerged from a residency, over the past two years, at Hornsey Town Hall in Crouch End. A Butoh influenced solo, inspired by the Japanese 16-century painting ‘Gekka Shourin Zu’ (The Pine Forest Under the Moon). The black & white brush painting depicts the offshore pine forest lit under the moonlight creating a myriad of dark & light shades – some vividly lit by the moonlight, others faintly withdrawn by the morning fog. In the state of flux this subtle yet powerful ghostly presence will slowly transform into a surge of galloping white horses. This early stage of work-in-progress will challenge and create a visceral sketch through selected choreography. Rigorous investigation guided by a somatic approach and Butoh’s culturally diverse ways of seeing will develop the work in depth revealing hidden stories of the pine forest. Static and dynamic states will be fully played and seemingly conflicting qualities such as ‘violence in stillness’ will be investigated. 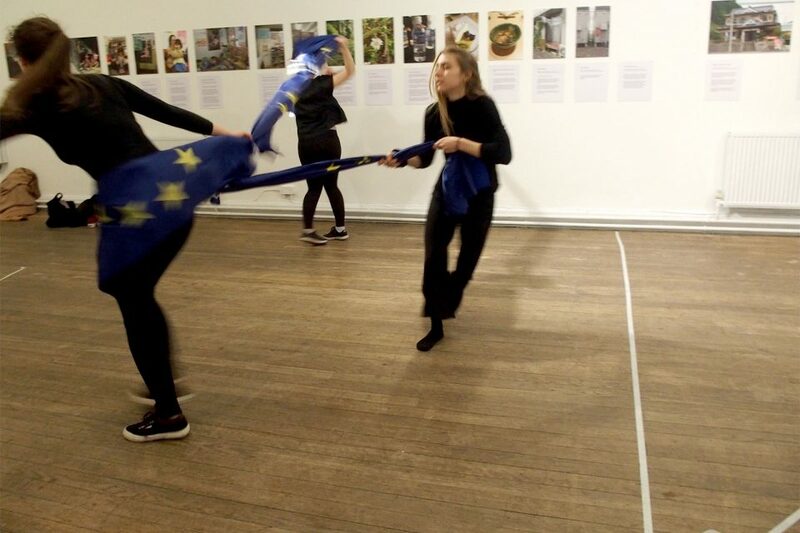 JaneTurner is also working with students at London Metropolitan University for an evening of New Choreographic experiments influenced by the science of self-organisation, swarming, social activism, somatic discovery, bees and honey. Come and be engaged and entertained by students and emerging artists in new choreographic and theatrical configurations. Including the Bee Friendly Trust’s Waggledancers.